Situated between two of Florida’s major cities and tourist areas, Orlando and Tampa, you will find the city of Lakeland. The city of Lakeland was named for its 38 beautiful lakes. Residents of Lakeland enjoy being close to it all, while living in a community which continues to have that small town feel. It’s not unusual in Lakeland, for residents to have close ties with their neighbors. That’s why a pool by Challenger Pools is the perfect addition to your Lakeland home. A custom pool in Lakeland is perfect for inviting the neighbors over for a swim, or maybe an evening of outdoor dining from your outdoor kitchen by Challenger Pools. If your home is on the lake, we can create a backyard oasis that incorporates your lake view. 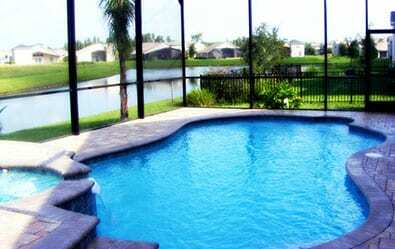 Are you looking for a custom pool builder for your Lakeland home. Challenger Pools is happy to service the community of Lakeland. Challenger Pools can provide you with a custom pool design that incorporates your homes aesthetic. We can design a backyard oasis your family will treasure for years to come. We specialize in custom pools, spas, screen enclosures, patios, and outdoor kitchens. Whether you are looking for a new outdoor space for relaxing and entertaining, or a remodel of your existing space, Challenger Pools is your first choice. When it comes to custom pools, nothing beats a Challenger pool. With everyone busy, adding a pool to your Lakeland home can provide endless family entertainment. Reconnect with your family and refresh after a long weekday, or spend the weekend at home creating treasured family memories. Think of your new pool as your own private spa and resort. Challenger pools are beautiful to look at. 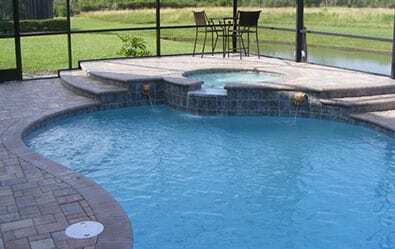 We custom design each pool to beautify your home and add value to your Lakeland home. Average pool construction by Challenger Pools takes around 6 to 8 weeks from excavation to relaxation. Your pool will be installed and swim ready before you know it! We offer a wide variety of upgrades to personalize your custom pool design. Including your choice of tiles or brick pavers. Challenger Pools has built over 8,000 swimming pools in Tampa Bay neighborhoods, including Lakeland. We are always happy to provide references to help you make your final decision before hiring a swimming pool contractor. The first step is scheduling a no-obligation consultation to discuss your swimming pool construction. We are happy to offer evening and weekend appointments in Lakeland.